How much salt can rice plants take and still live? Salt, 6 grams of it a day, enables us to function normally; a dose more than this on a daily basis would cause our kidneys to fail. Fortunately, we can flush this extra salt out of our system by drinking lots of water. Unfortunately, rice plants cannot get rid of extra salt the way we do. And those near coastal areas, where seawater tides overflow onto the fields; or those in inland areas where soluble salts in river streams or canals intrude into rice paddies are at high risk. 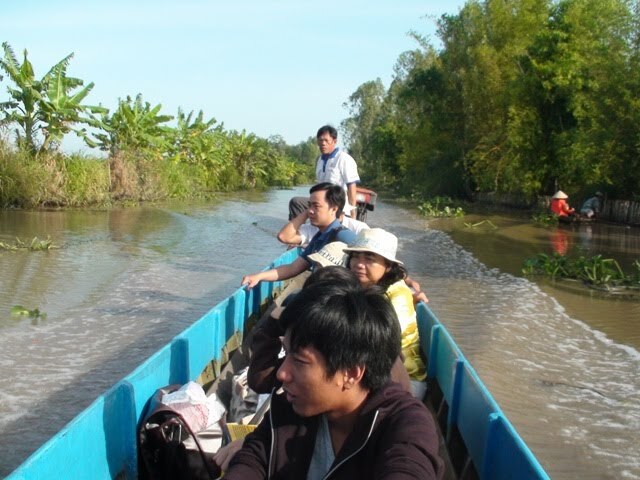 I would need a type of rice variety that could survive flooding and salty soil (Mr. Nhuong, rear portion of the boat). Salt-stressed rice fields. “When water comes into our fields because of the high tide , sea water also moves into our fields, bringing in more salt. Due to high water, we plant late (dry season is from late December to early January) so we harvest late. With this late schedule, brown planthoppers, birds, and rats attack the rice plant, causing yield losses, 30% to 50%. Rice plants also die because of the salt stress in the dry season rice,” says Nguyen Minh Triet, a farmer from Bac Lieu, Vietnam. FAO (Redfern, undated) reports that, although many areas in Southeast Asia are appropriate for rice, salt intrusion has robbed these soils of nutrients, making these places unfit for rice production. Low water levels in Vietnam’s Mekong River Delta, the country’s rice bowl, have resulted in an inward flow of salt water, increasing salin¬ity in the river water and stealing the nutrient richness of rice paddies . In 2010, salt quietly crept over a 70-km inland radius, extending its reach all the way to Cantho, claiming an estimated annual land area of 1.8 million ha hostage to dry-season salinity. Hinh Nguyen Minh Triet is one of the many farmers affected by salty and flooded rice fields. How much salt can rice tolerate? Studies show that at 3% salinity level, rice yields were reduced by 20-45% when salt stress occurred during the tillering stage. A higher reduction of yield (10-40%) was observed when salt stress occurred at heading. Rice had a much lower yield with higher salinity level (6%) during tillering. Since ages past, rice farmers in the coastal Mekong Delta have faced salinity-driven problems. But these problems will be more pronounced, particularly on rice yields, as sea level continues to rise and weather patterns become more severe and unpredictable. Partnership. In shielding rice farmers from the adverse impact of low rice production, the Cuu Long Delta Rice Research Institute (CLRRI) works in partnership with CURE scientists to develop new saline- and submergence-tolerant rice varieties. They integrate genetic improvement into existing rice varieties and incorporate management strategies in handling these varieties in farmers’ fields. As new improved rice varieties are being developed, they engage the farmers in testing and validating the performance of these varieties. 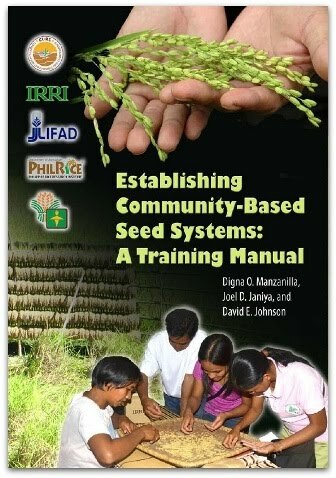 Through participatory varietal selection, farmers are able to screen and score rice varieties that they prefer the most or the least. These activities aim at improving food security among poor farmers in Vietnam. Genetic improvement. Scientists working on salt-tolerance are also now combining this trait with submergence-tolerance. Using molecular breeding through the use of DNA markers, scientists are able to pin down and tag chromosomal regions that contain the desired traits that would be incorporated into the rice breeding program. “In 2013 due to high water, we could not reduce salt in the soil. 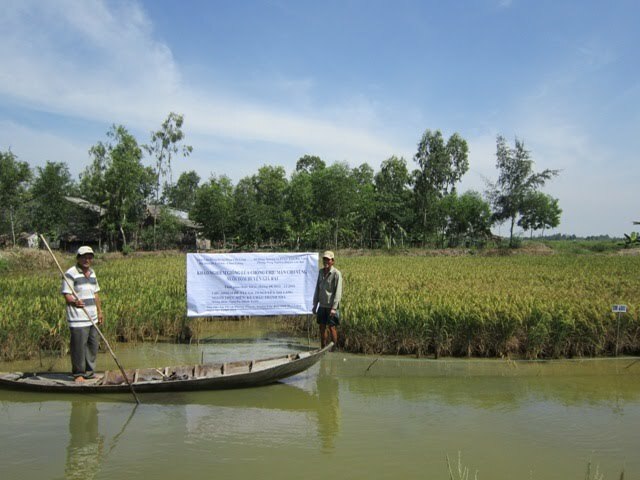 In addition, flooding resulted in delayed planting, harvesting, and planting again the succeeding rice crop. The delays caused high infestation of brown planthoppers, rats and birds and we spent more money on pesticides. Our rice plants, which were submerged, died after 7 days of sowing. The plants that survived had low yield, poor quality (rice grain color not bright, more unfilled grains, light weight grains) and required high labor cost. We faced heavy debts, our children stopped schooling. I would need a type of rice variety that could tolerate flooding and salty soil. I would also prefer a variety with sturdy/strong stems to prevent lodging.” Nguyen van Nhuong , Vi Thuy , Hau Giang. Using the above situation as a jumping board, scientists, aiming at combining salt tolerance with flood tolerance in new rice varieties adapted to the Mekong Delta, would significantly help rice farmers secure food for the region. Already, positive results are seen in some newly developed varieties that can yield 5-6 t ha-1 under with salinity levels of 8.0 dS m-1. The varieties with the salt-tolerance trait include, among others, OM5629, OM4900, OM7347, OM6162, OM6161, OM6677, MNR4, OMCS2009, Mot Bui Lun , Mot bui Do, and Tep Hanh. “Last year, my problem on flooded and salty soils reduced my crop harvest by 10-20%. Thanks to the program from CLRRI-IRRI linked with CURE and Clues project, the new variety, OM 6677, had high yield and tolerance for salt stress. We need the government's help in increasing our skills and technical knowledge; we also ask for support through better extension work, agricultural information, credit provision, and appropriate farm supplies.” Nguyen Th ut Nau, farmer from CaMau. Network. 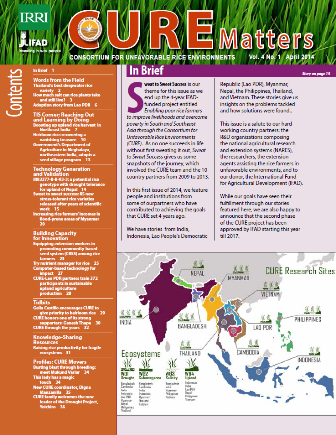 The partnership between CLRRI and CURE has also established a strong network of researchers to validate and outscale these salt-tolerant varieties across participating countries. The benefits derived from this type of partnership are training of farmers and researchers on new improved stress-tolerant rice technologies. Both researchers of partner countries and farmers are able to adopt these technologies and achieve yield targets. It also ensures sustainability of collaborative research and development efforts related to food security of rice farmers. We need the government's help in increasing knowledge (Nguyen Thi Ut Nau). Breeding salt-tolerant rice varieties by molecular marker method is a creative breakthrough that promises a bright future for farmers. 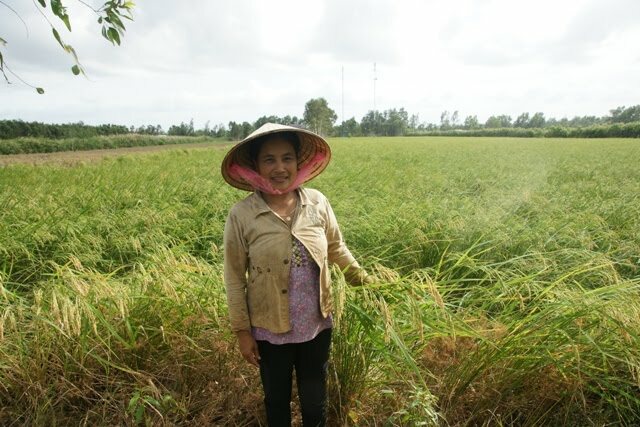 The technology of screening, tagging, and embedding the gene for salt tolerance into rice varieties brings hope to farmers as they face the adverse impacts of climate change in the Mekong Delta. How much salt can rice take and still live? Climate change and its impact on the Mekong Delta, particularly on soil and water, will remain a key challenge for Vietnamese farmers. The road to increasing salt tolerance and/or flooding/drought tolerance of rice varieties will be traversed by researchers and farmers. Already, Vietnamese researchers have developed four salt-tolerant varieties (OM5629, OM5981, OM6377, and OM4900 from 2009 to 2011), although, these were not under the auspices of IRRI-CURE. As Vietnamese researchers find the answer to the question on how much salt can rice take and still live, they can further probe how these varieties perform in farmers’ fields. Dr. Nguyen Thi Lang is a professor and plant geneticist at Cuu Long Delta Rice Research Institute (CLRRI).